The inscription translates "Hamida Banu Begum, zauja (wife) Shah Jahan Badshah (king)". Collectors and dealers are usually pleased to find an old inscription on a painting, assuming it to be correct, but this is often - like here - not the case, in this instance having a husband still to be born! 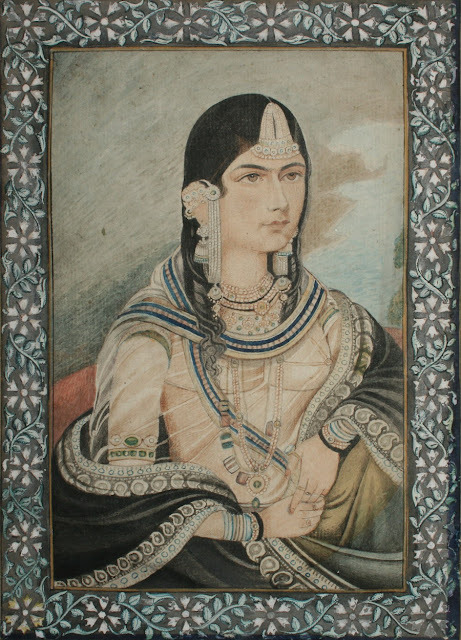 Identification of portraits Mughal Emperors' wives are notoriously difficult to identify due to the artists never having seen them, meaning they instead painted imaginary likenesses according to contemporary notions of beauty. Hamida Banu Begum's legacy is the mausoleum she commissioned, Humayun's Tomb, following his death.